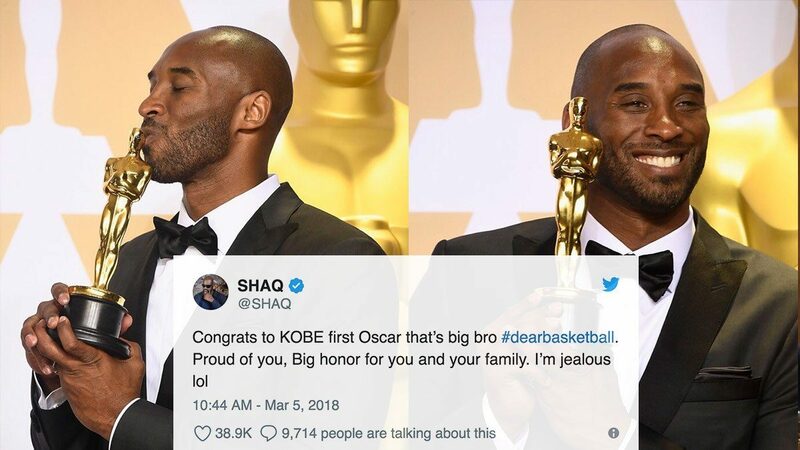 Add Academy Award winner to Kobe Bryant's long list of titles, as the NBA legend took home an Oscar statuette for Best Animated Short with animator Glen Keane for the film Dear Basketball. The five-time NBA champion, one-time league Most Valuable Player, and two-time Olympic gold medalist, among other individual honors, narrated the short that was based on his retirement poem, which dates back to 2015. Dear Basketball tells the story of Bryant's hoops dream, starting out in Italy and spending his entire pro career (20 years) with the Los Angeles Lakers. Some netizens pointed out some of the biggest Hollywood names that the NBA superstar bested with his lone entertainment trophy. Others gave their collective thumbs up to Bryant for taking the chance to oh-so-subtly shut down a certain reporter's "shut up and dribble" rhetoric. Who's the [Hollywood] GOAT now?